The top of Marmolada Dolomites is famous and the route on the Western crest is a dream of many mountaineers like the "Normal route" of Mont Blanc, however easier, or the crests of Matterhorn, much more technically difficult (good rock climbing experience is necessary). The via ferrata on the Western crest is classified as "difficult" but as always the difficulty at high altitude depends on the environmental conditions which here can vary extremely. Once there had been one meter of snowfall at the end of June and two Danish climbers dug trenches in the snow to reach the top which took 14 hours (and many risks) for the entire trip. In contrast, at the end of September 2007, some mountaineers have reached the top with light hiking shoes, never worn crampons. When: whenever you want, from June to September, provided during the week and safe weather. Number of participants: minimum two, maximum three and better with the same skills and mountaineering experience. The price including the rent of technical gear required. 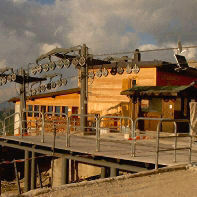 Excluding: food and drinks in the mountain lodges (calculate 45 Euro per person per day), excluded fares for cableways. The program: usually we start from Rovereto (highway exit) or from the Lake Garda North area by car or van of our mountain guide, at 9 a.m. and we reach the Lake Fedaia at 11.30. We ascent to the mountain lodge Pian dei Fiacconi by cableway in 20 minutes and we deposit our belongings in the sleeping room. At about 2 p.m. we climb up to the adjacent glacier (about twenty minutes hiking) for some training: how to wear the crampons, how to use the ice axe, how to belay on the rope on a glacier and for more interesting participants: crevasse rescue and self-rescue from crevasse. At the end some short lessons in mountaineering by our patient mountain guide. The next day, breakfast at 6.30 a.m. and departure at 7.30 a.m. Estimated return to mountain lodge in the early afternoon, we drink a beer/mineral drink and we descend to the parking lot by cableway. Expected return at Lake Garda or Rovereto around 6 p.m. Important note: for the participants who reach Trentino by plane, we offer airport transfer and pick up (for a supplementary cost - upon request). What to bring with: all the technical gear is being provided by our Mountaineering School Arco (helmet, harness, crampons, via ferrata-set, ice-axe, rope, etc.). 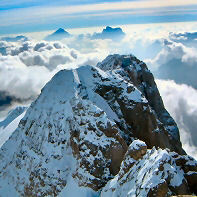 You just need to bring a pair of solid mountaineering boots. Regarding the remaining mountaineering equipment such as clothing, we will provide you with a list after the booking. Three days holidays in the Italian Alps Europe by Mountaineering Guides Arco Trentino, Four days advanced course in the Brenta Group on the famous route Bocchette di Brenta with overnight stay in mountain lodge Trentino. Mountaineering School Arco Lake Garda suggest the crossing of Brenta Dolomites on the rout Bocchette di Brenta in the Alps. 3 or 5 days hut to hut across beautiful multicolor walls with overnight stay in the mountain lodges. From the mountain lodge Pian dei Fiacconi we slightly descend towards a rocky outcrop from where it is possible to see the Forcella Marmolada (the deeper pass) and below the Vedretta del Vernel (a small glacier). 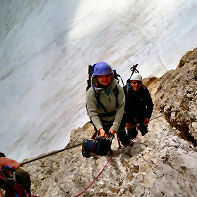 We climb up following a small track on the glacial moraine and later we climb on the vedretta. We suggest the use of crampons. From the top of the glacier you can see the cable and there are a comfortable place to take off the crampons and put on the via ferrata set. At the starting point you will find a terminal crevasse. At the beginning of the season it can be covered by a solid bridge (check in any case with your ice-axe). In September it has happened often that we had to climb down into the crevasse and up on the other side. In June it It is still possible to find the first part of the cable submerged in the snow. In this case you can climb up the slope left of the via ferrata with your ice axe. In such situations we strongly recommend the use of the rope. When we reach the Forcella, we are facing a large cave dug into the rock during the first World War and downwards to the right there is a short track (30 m) which is leading on a path to Rifugio Contrin which is located in the homonymous valley. From here we start our the Western crest tour. In the beginning across smooth slabs with a lot of brackets and rather exposed crossings. For a long stretch the route is running on North facing walls and frequently the cable and the brackets are clogged by ice. In this case we recommend to take out the rope and proceed like on a multi pitch rock climbing route because a fall here would be fatal. Later the trak moves up to the Western crest in more sunny crags and this part is more fun, exposed and with beautiful views: to the left we can glimpse the white North face, to the right the amazing 1000 meter high South wall is below your feet. If you are lucky (and too late) you can meet the rock climbers who are climbing the last pitches of the routes "Via Solda" or the horrible final channel of The normal route on the South wall. Don' t be shocked, if the climbers will speed past you running with sneakers: it is another dimension of rock climbing experience and our mountain guide will for sure remember and explain to you the personal adventures on the South wall. The last part of the via ferrata takes mostly place on the snow and we walk left of any overhanging frames of ice, then we turn again to the left and suddenly we can see the Capanna Punta Penia (the mountain lodge on the top) and our top at an altitude of 3.343 meters. The Capanna is open from late June to early September and we can eat a pasta and drink a beer on the highest top of the Dolomites Alps. We cross with crampons the large summit plateau in the direction NE until we reach a ledge which is slightly steeper. In case of ice we must be careful during the final passage because here many falls and accidents have happened on the North face. At the end of the ledge we reach a short equipped trail (ca. 200 m) which leads down into a large valley covered of snow or ice. Be patient und remain belayed on the cable in case you meet people who are climbing up (during the last years the normal ascent of Marmolada has been crowded with tourists). At the end of the descent, we cross the valley until we reach the rocks on other part and we descend. In any case remain belayed on the rope on the first steep slope. Here we take a rest and we look to the left towards on a rocky edge. We can see a hollow in the rocks which is about 40 meters high on the glacier: it is a tunnel which had been dug through the wall in the year 1916. You will immediately realize how short will be the life of the glacier (40 meters lost in 60 years, another 40 meters remaining, how many years before the glacier has disappeared ?). Forget the sad news, we enjoy the panorama and we climb down to the mountain lodge Pian dei Fiacconi. The hiking time of our mountain guides with their clients for this described round trip varies from seven to nine hours. We even write what is obvious because we often end up in unpleasant situations such as someone has "forgotten" the crampons in the Rifugio Pian dei Fiacconi or on the top Punta Penia. Obviously, for this type of routes it is necessary to have a good physical condition and it sometimes even the use of the rope is necessary. A propos, we have often met "mountaineers" with the rope on their back but without an idea on how to make a knot or how to build a belaying spot on ice. We would like to invite the "experts" to ask themselves questions like: Am I able to belay on the ice-axe ? Do I know I the correct rope manouvres for crossing a glacier with several people? What shall I do, if a part of cable on the route is clogged by ice ? (it happens often) Finally some questions for the top "experts": Am I able to rescue a person from a crevasse (at least with by "Vanzo" system) ? 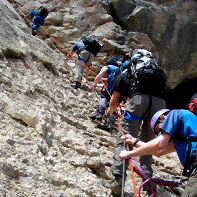 If you have any doubts about the answers, it is better to attend our mountaineering course. If you go on the Western crest of Marmolada, in certain environmental conditions, you will realize this is not only advertising. We drive by car to Lake Fedaia which is located at an altitude of ca. 2000 metres and where we can park the car conveniently. From the parking lot it is possible to climb up to Rifugio Pian dei Fiacconi early in the morning and to reach the top of Marmolada in one day but the elevation difference of ca. 1500 m does require an excellent physical condition. We recommend to ascent to the mountain lodge Pian dei Fiacconi by cableway or by foot on the day prior to the ascent to the top of Marmolada and to spend the night in the mountain lodge. In the afternoon our mountaineering guides teach the proper use if crampons and several rope maneuvers on the glacier (see our program). 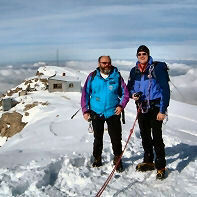 The Rifugio Pian dei Fiacconi offers very good food, beer and wine. It is a good place to spend the night at a reasonable price. Avoid to take the first cableway at 9 am. and to reach the starting point of Western crest at 11 a.m. with the risk of a thunderstorm (the cable is a favorite path for lightning !). With uncertain weather or unfavorable conditions (example: too much snow, poor physical condition, etc), please choose a different and more simple route at Lake Garda. Do not proceed on one rope with five people who maybe speak different languages and have different prior mountaineering experience as you might end up in the "Tower of Babel". 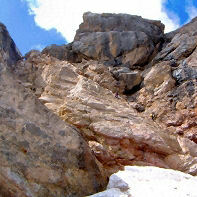 Your climb on the via ferrata on the Marmolada could thus become the memory of a stressful day. Exercise the rope maneuvers together with your companions before you are leaving to the Italian Alps. In case you have doubts about your knowledge and experience regarding your mountaineering capacity, please do not hesitate to consult our mountaineering School or mountain guides, before you are leaving to the Marmolada. Our mountain guide School Arco Lake Garda is always at your disposal for requests or questions about alpinism, mountaineering, trekking, via ferrata, rock climbing and every type of courses, everywhere in the world.